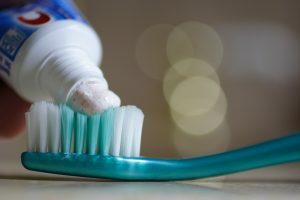 Toothpaste combined with the correct brushing technique will eliminate plaque, which is a harmful layer of bacteria that develops on your teeth. Plaque left on your teeth will cause tooth decay, cavities, tooth loss, and gum disease. Toothpaste with fluoride encourages re-mineralization that will cause the tooth to be more resistant to decay. As well as helps in repairing early tooth decay before damage can be noticeable. Toothpaste contains special ingredients that clean and polish teeth while removing stains with regular use. Toothpaste will keep your breath fresh, giving your mouth a healthy clean feel. What type of toothpaste does Voyles Family Dental recommend? Any brand of toothpaste will do, as long as it contains fluoride.. All toothpastes containing fluoride are effective in fighting plaque and cavities, keeping your tooth enamel clean and polished. Toothpastes containing hydrogen peroxide and/or baking soda are also recommended. These ingredients are both effective cleansing agents that will keep your mouth clean, fresh, and pleasant. Fluoride, however, is still the most effective ingredient in protecting your teeth. Choose a sensitive toothpaste if you have sensitive teeth. These toothpastes contain potassium nitrate or strontium chloride that block the tubes in the teeth that are attached to the nerves, so the exposed dentin are protected. Use this desensitizing toothpaste at least a month for best results. Tartar-control toothpaste contains pyrophosphates, that prevents the accumulation of soft calculus deposits on the teeth. Toothpaste with whitening formulas helps remove stains but are not as effective as in-office whitening procedures or those recommended by your dentist. Always choose a toothpaste with fluoride that has the American Dental Association (ADA) Seal of Acceptance. This seal indicates that the toothpaste has shown sufficient evidence of efficacy and safety in controlled, clinical trials. A pea-size of toothpaste is enough to brush your teeth. Just make sure you brush correctly. Brushing, even after each meal, is not enough to fight cavities and gum disease. So floss your teeth every day to eliminate food particles between teeth and at the gum line and to eliminate plaque. Plaque, according to studies, comes back on clean teeth within 3-4 hours after brushing.